(HealthDay News) -- As the start of a new school year approaches, parents need to think about the comfort and safety of their children's backpacks, an expert says. "Backpacks are designed to distribute the weight of load among some of the body's strongest muscles," orthopedic surgeon and American Academy of Orthopaedic Surgeons spokesman Dr. Michael Wade Shrader, said in an AAOS news release. "But when worn incorrectly, injuries such as strains, sprains and posture problems can occur," he said. "While some of these injuries can be minor, others can have a lasting effect on kids, and follow them into adulthood." More than 24,000 people were treated in U.S. hospitals and doctors' offices for backpack-related injuries in 2012, and more than 9,500 of those patients were aged 5 to 18, according to the Consumer Product Safety Commission. Children should carry no more than 15 percent to 20 percent of their body weight. 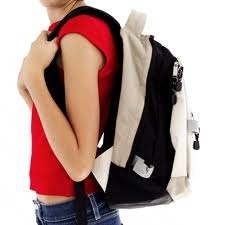 They should use both shoulder straps on backpacks and adjust the straps to keep the load close to the back, the AAOS and Pediatric Orthopaedic Society of North America (POSNA) advised. Other tips: When lifting backpacks, bend at the knees. Remove or reorganize items if a backpack is too heavy. When packing, place heavier items low and toward the center. Carry only items that are required for the school day or for homework. Parents should buy a backpack that's an appropriate size for the child. They should encourage their child to alert them about numbness or tingling in the arms or legs, which may indicate that a backpack fits poorly or that a child is carrying too much weight, the AAOS and POSNA said. Watch your child put on or take off a backpack to see if they have difficulty. If a backpack appears too heavy, have the child remove some of the books and carry them in their arms to ease the load on their back. Children should be encouraged to stop at their locker throughout the day to drop off heavier books. The American Academy of Pediatrics has more about backpack safety.